Lisa Harbatkin contributed an article on the investigations, titled "Teachers on Trial," to the Winter 2016 issue of New York Archives. It's not on the magazine's web site, but you can read it here. Reds At the Blackboard, Clarence Taylor's clear-eyed, definitive political history of the New York City Teachers Union and its role in the development of social unionism, is now out in paperback from the publisher, Columbia University Press (http://cup.columbia.edu/book/reds-at-the-blackboard/9780231152693 ). Amazon also has the paperback, along with a Kindle edition (www.amazon.com/Reds-Blackboard-Communism-Rights-Teachers/dp/0231152698). Taylor traces the TU' s history from its 1916 founding to its disbanding in 1964, covering its ties to the Communist Party, but also, and especially important, its role in fighting for teachers' rights, children's rights, and for racial equality and civil rights. The TU championed the teaching of black history and campaigned for helping children living in poverty. Taylor's study brings the TU, its leaders, and its members back to life as he tells their story. The Supreme Court denied certiorari in the case I brought to fully open the anti-communist files held by New York City’s Municipal Archives. Two important things here — the First Amendment, which was the basis of the appeal — and just the plain need to more fully open all records from the mid-20th century McCarthy era so more research can be done into its impact on the people directly affected, and on the political and social impact on the country. The New York Court of Appeals decision this past spring declined to consider the 1st Amendment issue raised in our effort to fully open the Anti-Communist Series held by the New York Municipal Archives. We have appealed for certiorari to the U.S. Supreme Court, and the Court has directed the city to file a reply. You can read our cert petition and the city's reply here. Two U.S. Supreme Court decisions growing out of New York state investigations bookended the struggle. The 1952 Adler decision rejected the claim that academic freedom provided teachers and professors with protection against being investigated for their political beliefs. Years of court cases at all levels eventually chipped away at loyalty investigations and the refusal to acknowledge the primacy of academic freedom. In the 1967 Keyishian case the Court reversed Adler and declared that freedom "a special concern of the First Amendment, which does not tolerate laws that cast a pall of orthodoxy over the classroom." Marjorie Heins is a civil liberties lawyer, writer, and teacher, and the founding director of the Free Expression Policy Project. She wrote the profile of Irving Mauer, one of the teachers whose cases she covers in Priests of Our Democracy, here at Dreamers & Fighters. You can read it at http://www.dreamersandfighters.com/mauer/inter_mauer.aspx. Irving Adler died September 22, 2012 at 99. Math teacher, mathematician, children’s and adult book author, fighter for civil liberties, Adler was among the first teachers called in for questioning by Saul Moskoff, in January 1952. He was suspended later that year, and forced out in 1954. Adler was the lead plaintiff in the first case to challenge the Feinberg Law. The teachers won in New York’s Supreme Court, but lost in the higher state courts, and in the United States Supreme Court. Following the Court reversal of that decision in 1967, Adler was among the teachers who sued for reinstatement and restoration of salary and/or pension rights. They won. Adler’s publications after he was forced out of the school system had important impacts in math and science education. His scientific journal papers on Fibonacci numbers helped revive interest in studying the arrangement of plant spirals in Fibonacci sequences. The video clips page here at www.dreamersandfighters.com has two clips of Adler, and you can read him in his own words here. Albany -- The New York Court of Appeals issued its ruling on the case to fully open the Anti-Communist Series records on June 5, 2012. You can read it here. Click here to go to the Court Documents section below to see the briefs in the case. 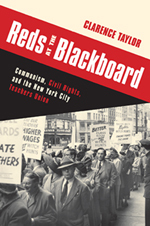 Columbia University Press has announced the publication of Reds at the Blackboard: Communism, Civil Rights, and the New York City Teachers Union by Clarence Taylor. In perhaps the first detailed study of the Teachers Union and its deep history with the American left, Clarence Taylor traces some of the TU's most explosive battles from its founding in 1916 to its 1964 decision to disband. 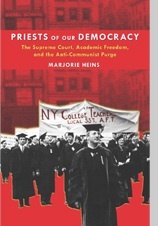 He recounts the union's early, unofficial partnership with the American Communist Party, its advocacy of a number of Party goals, and the backlash created as the union threw its support behind controversial policies and rights movements. But Taylor's research makes it equally clear that the organization was anything but a puppet of Communist power. Reds at the Blackboard showcases the rise of a unique type of unionism that would later dominate the organizational efforts behind civil rights, academic freedom, and the empowerment of blacks and Latinos. Through its affiliation with the Communist Party, the union pioneered what would later become social movement unionism, solidifying ties with labor groups, black and Latino parents, and civil rights organizations to acquire greater school and community resources. It also militantly fought to improve working conditions for teachers while championing broader social concerns. For the first time, Taylor reveals the union's early growth and the somewhat illegal attempts by the Board of Education to eradicate the group. He describes how the infamous Red Squad and other undercover agents worked with the board to bring down the TU and how the union and its opponents wrestled over anti-Semitism and other issues as the anti-communist investigations ran their course from Rapp-Coudert through the early 1960s. New York -- The lower court decided in favor of the city in Lisa Harbatkin's lawsuit to fully open the Anti-Communist Series records in New York's Municipal Archives. You can read the judge's decision here. The next step is the Appellate Division. MONTPELIER -- Dr. Irving Adler of North Bennington, who as a public school teacher in New York was blacklisted during the McCarthy era, will be presented with a Lifetime Achievement Award at the American Civil Liberties Union of Vermonts annual meeting Saturday, Oct. 31 at the Capitol Plaza in Montpelier. Adler, 96, was among nearly 400 New York teachers who lost their jobs following passage of that states Feinberg Law, which prohibited members of subversive organizations from teaching in New York schools. Adler went on to become an author, writing childrens books, textbooks, and works on education theory and philosophy, and still later in life a scientist with an interest in mathematical biology. Adler moved to Vermont in 1960, where he was president of the Vermont in Mississippi Project, chaired the Coordinating Committee of Vermont Peace Organizations, served on the Shaftsbury and Mt. Anthony Union High School boards, involved himself in myriad other civic projects, and wrote frequent letters to his local paper, the Bennington Banner. As a young man in New York City, Adler had been active in politics and union organizing. He had joined the Communist Party, an affiliation that led to his blacklisting in 1954 under the Feinberg Law. Adler and others challenged the law in court, eventually taking their argument to the U.S. Supreme Court. There they lost. Nearly 20 years later, however, a subsequent Supreme Court decision overturned that ruling, and Adler won back the right to teach in New York schools. A documentary film is now being made of the teacher blacklisting. The film was the subject of a New York Times article this summer after the filmmakers complained that the government was still -- a half-century later -- blocking access to government files about the cases. Information about the film can be found at www.DreamersAndFighters.com. The ACLU-Vermonts Lifetime Achievement Award is not given annually. Instead, it is awarded only occasionally, to those individuals who throughout their lives have shown a steadfast commitment to protecting and promoting Americans individual rights. The ACLUs annual meeting begins at 9:30 a.m. Updates of ACLU activities, the awards, a fundraising auction, and luncheon follow, with a guest speaker offering the keynote address in the afternoon. The ACLU is a nonprofit organization with 2,500 members in Vermont and 500,000 nationally. It accepts no government funding for its work, relying instead on contributions from private citizens. Its sole function is to protect the civil liberties enumerated in the U.S. Constitution. On June 16, 2009, The New York Times published a story about writer Lisa Harbatkin’s lawsuit aimed at requiring the NYC Municipal Archives to fully open the Anti-Communist Series records now in its holdings. This article, by veteran reporter Ralph Blumenthal mentions our documentary, Dreamers and Fighters: The NYC Teacher Purges, and sensitively evokes the Teachers Union blacklist era. Freedom of information laws (FOIL) and the free speech clause of the First Amendment form the basis of the case I have filed to fully open the records in the New York City Board of Education's Anti-Communist Series now held by the city's Municipal Archives. The main court papers linked below suggest some of the history of those investigations and how much more can be learned with all the records open. Please stay in touch with us here at www.dreamersandfighters.com to follow the progress of the lawsuit. All the files will open in PDF format. Do you need the free Adobe Acrobat Reader? Click on the logo to download the newest version.